Affirmations and how to make them work for you - is a topic that comes up a lot in my work as a Manifestation Coach. And for good reason! Affirmations have the power to affect your subconscious mind which is what makes them such a powerful manifesting tool! Even though I have been a student of Manifestation since I was just 14, actually using affirmations in my manifesting practice is a relatively new thing for me. You see, I had tried using affirmations to manifest things in the past but, they never worked, so I had pretty much given up on the idea. Why aren't my affirmations working? That was until last year, I figured out how to use them properly AND make them work for me in my manifesting process. Did they manifest into something? Absolutely! 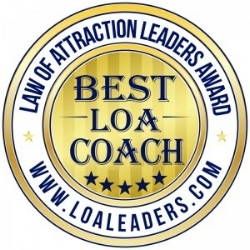 I won the award for 2017 Manifestation Coach of the year - which was totally unexpected! I also won lots of other unexpected things like: a membership to Business Chicks (which my girlfriend put me up for without me knowing), raffle prizes, cash and more! So, if you want to use affirmations as a tool to manifest more amazing things into your experience here’s: how to make affirmations work for you! HOW TO MAKE AFFIRMATIONS WORK FOR YOU! I believe this is because they were too long and complicated. When you keep you affirmations simple they then have a fun, easy and lighthearted feel to them! And this is the secret to making them more powerful! Because when they are long and complicated it means you are being too SPECIFIC, which quickest way to put you out of vibrational alignment! Automatically that affirmation puts me out of vibrational alignment with my desires! And the reason is because, its too specific which causes me to start worrying about the HOW! And this is a big No-No when you’re trying to manifest something! This is because it is the universes job to worry about the HOW! It’s the universe’s job to provide the MEANS to your manifestation - not you! That’s why, if you want to make your affirmations work for you, you’ve got to keep them simple! *You can read more about being too specific in my blog post: 3 Reasons why your manifesting isn’t working. 2. Put them on repeat. The second thing you need to do to make your affirmations work for you when you’re manifesting is to put them on repeat! Saying an affirmation once or twice just isn’t going to cut it! In order to make your affirmations work, they need to affect your subconscious mind! Affirmations affect the subconscious mind - that’s what makes them so powerful! And the reason this is SO important is because when you want to manifest something but subconsciously you don’t believe it’s possible - it’s never going to manifest! That’s why repeating your affirmation multiple times a day is key to making your affirmations work for you in your manifesting process! Even though I am recommending you repeat your affirmation multiple times a day - don’t make this a chore. Because the minute you make it a chore, the energy you will be emitting won’t be a vibrational match to the experience you want to create. That’s why, in Step 1, I suggested keeping your affirmations simple and lighthearted because this will make the process fun! And when you come from this fun, playful energy you are in a state of ALLOWING, which is the quickest way to have your affirmations affect the subconscious mind and manifest your desires! *I would also like to mention here, that once you get good at using affirmations in your manifesting process you can begin to make them more complex. This is because you would have already strengthened your belief in the process. 3. Keep your Vibe High! The last thing you need to do in order to make your affirmations work for you is to keep your vibe high! The reason this is so important is because you need to be able to raise your vibration UP to be an energetic match to the thing you want to manifest! The process that I use myself and with my clients to help them raise their vibration and become an energetic match to their desires is my FREE Mini Manifesting Ritual, which you can grab a copy of below. What you will find when you start actively raising your vibration, is that your intuition will begin to speak to you and tell you EXACTLY what steps you need to take in order to make your desires manifest! This IS the path of least resistance! Part of the work I do with my clients (very early on in the coaching process) is to asses ways they can actively raise their vibration. This will include things like: meditation, diet, exercise, and healing techniques that will affect the subconscious mind. It really doesn’t matter how healthy and spiritual you consider yourself to be, there is ALWAYS more work to do! I kept them simple, repeated them often (so they would affect my subconscious mind), and, actively raised my vibration! Try the steps I have mentioned above! 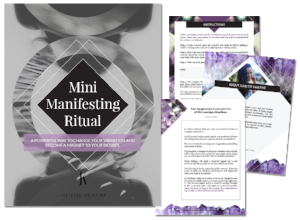 For MORE manifesting tips - grab a copy of my FREE Mini Manifesting Ritual below. As always, if you have any manifesting questions please pop them in the comments below, I would be happy to answer them!